To start off this week, I’d like to say thank you to all my regular blog readers. 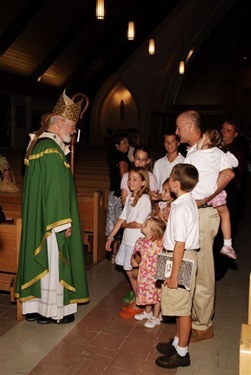 I enjoy putting it together every week and I enjoy even more hearing from all of you, not only through your comments, but especially when I visit parishes and schools. I want to say a special hello to all the young people in Sydney who kept coming to me on the streets to tell me that they read and enjoy this blog. Keep reading! Saturday, I was at St. John the Evangelist in Chelmsford to watch Alma Bella Solis enter the life of a consecrated virgin. 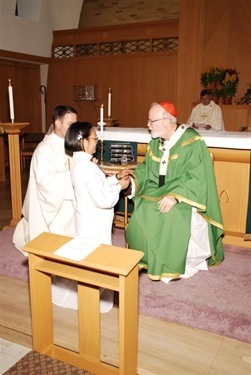 The consecration was held at a regular parish Mass, so many of Alma’s fellow parishioners as well as members of her extended family and other consecrated virgins from our archdiocese and other dioceses were all able to attend. The celebration was hosted by Father Paul Ritt and the women of the parish provided a lovely wonderful reception in the parish hall to mark the event afterwards. 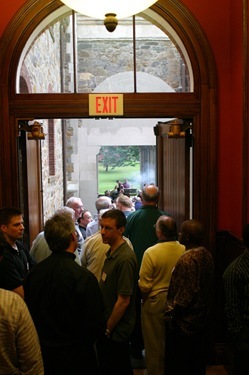 For most of the Catholics there, it was the first opportunity they had to witness the consecration of a virgin or even to become aware that this vocation exits in the Church. I tried to explain that like the permanent diaconate, consecrated virgins were very much a part of the early Church. 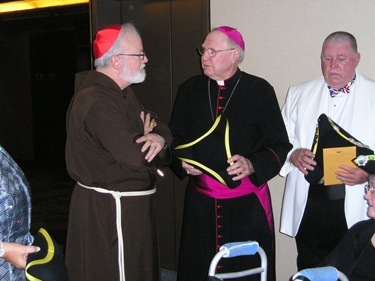 This has simply been a restoration of this vocation to the Church. It is wonderful that these individuals who have embraced this vocation are witnessing to their faith and at the same time serving the Church in many different ways, as well as by their constant prayers for the people of God. 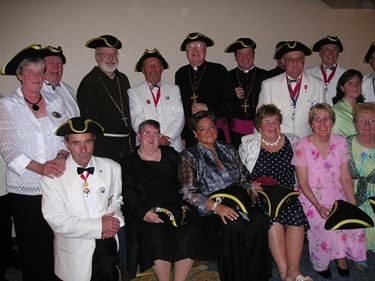 Once again on Monday, I was back in Quebec City, this time with the Massachusetts delegation to the 2008 Knights of Columbus convention. 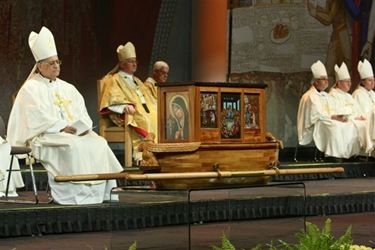 As those who follow this blog may remember, I attended the International Eucharistic Congress there last June. 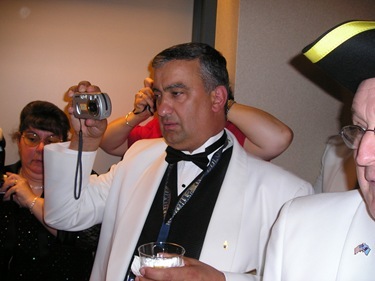 The group attending the Convention was so large that we were spread out into four different hotels. At at the Hilton hotel, the Knights had a corner hospitality suite on the 17th floor with a stunning view of the city. Although it is not clearly visible in the photos below, from that room we were able to see the whole wall that surrounds the city. 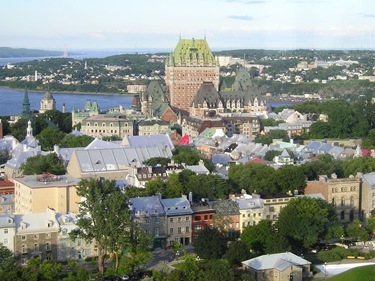 Quebec is a walled city included in the Patrimony of Humanity by UNESCO. 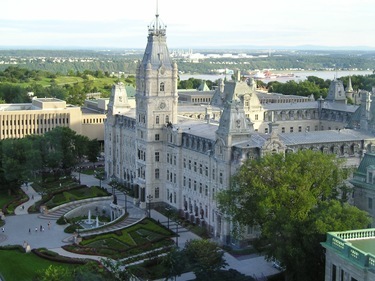 The view was absolutely breathtaking and from that view I really appreciated what a gorgeous city Quebec is. 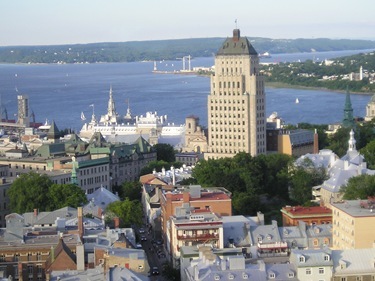 I could see the Plains of Abraham, the towers of St. Ann de Beauprey across the river, the parliament building, the Chateau Frontenac and the cathedral. It really was a spectacular spot. That night I had dinner with my very dear friend of many, many years, Bishop Octavio Cisneros, the auxiliary bishop of Brooklyn. He is a Cuban-American, and this year there were a number of Cuban American bishops in attendance with a delegation from Cuba. There is a great effort to try and rekindle the Knights in Cuba, where they had a tremendous presence before the revolution. There were also large delegations from Poland, the Philippines and Mexico. 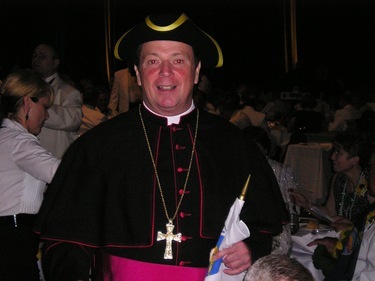 Tuesday morning, Quebec Cardinal Marc Oulette presided over and preached at the opening Mass, which was a beautiful celebration with many priests and bishops, magnificent choirs and many Fourth Degree Knights in their full regalia. I think there were over 2,000 participants. He spoke very beautifully on the Church’s magisterium and on life issues and commented on the anniversary of Humanae Vitae. It was a very moving talk, especially when he shared with us some of the fruits of the Eucharistic Congress held there earlier in the year and the impact it has made on the Church of Quebec. 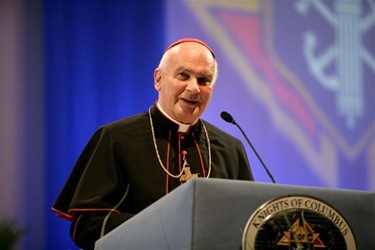 In his annual report, the Supreme Knight Carl Anderson said there are almost 1.8 million members worldwide in more than 13,000 councils. In the report, Anderson said the Knights had given $144 million to charities, donated 400,000 pints of blood and volunteered more than 68 million hours of community service. 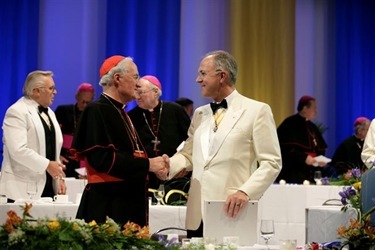 Last year, Carl spoke at Harvard about his book, “The Civilization of Love.” He has given outstanding leadership to the Knights and he is a great gift to the Church. 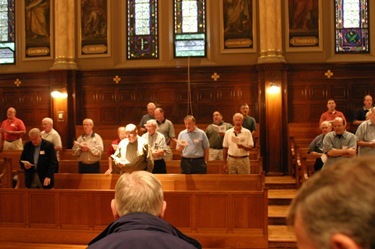 In addition to all their good works, they are poised to improve the spiritual formation of their members. I was pleased to see that the Knights have hired a recent Harvard graduate, Michael V. Brewer, to lead their outreach to college students, a program called “College Knights.” Michael is very bright and very involved in campus ministry. Every time I went to Harvard he would be there with his identical twin brother helping out at the Mass, doing the reading and helping out anyway they could. 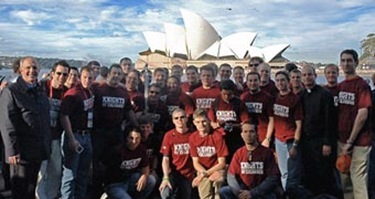 leading a group of 35 college Knights who attended WYD in Sydney. On Tuesday we also had the reception with the Massachusetts crowd. At that event, I was presented with an autographed photo of Miss Dolly Parton, who I understand to be a good woman of faith. It was a real surprise! At last year’s convention in Nashville, I had mentioned, “Oh, maybe we will get to see Dolly Parton.” It turns out, a determined group of Massachusetts Knights took my light comment seriously enough to try and book her for the state convention. I had no idea what was coming, but I appreciate the spirit of the gift. 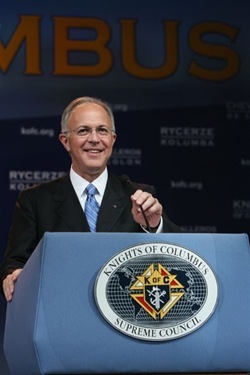 The Knights of Columbus are the world’s largest organization of Catholic men and they are responsible for so many works of charity. 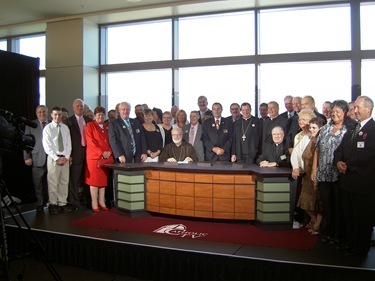 I am grateful the knights are active here in the archdiocese and I will do anything I can to help them grow here. 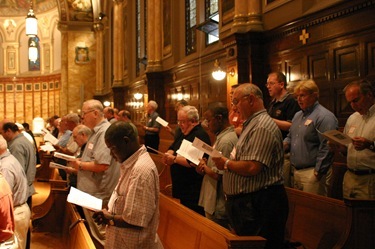 I would like to see a council in every parish in the archdiocese. They do so much both locally and universally. 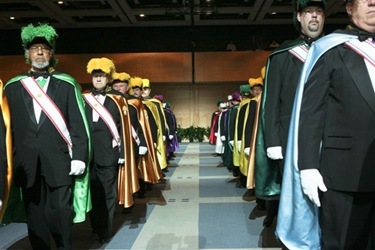 After the reception, there was the States Dinner, where all 72 jurisdictions of the Knights were represented. The dinner had an amazing roster of speakers, too. After Bishop William E. Lori of Bridgeport, who is the Supreme Chaplain of the Knight of Columbus, gave the invocation, Archbishop James Weisgerber of Winnipeg, the president of the Canadian Conference of Bishops welcomed us and we also heard from Cardinal Egan, who gave his report of the Holy Father’s visit to the America. 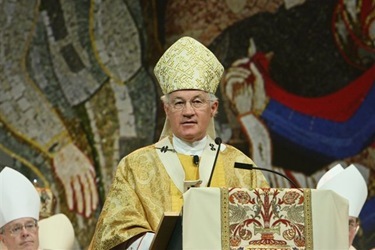 Cardinal John Patrick Foley, the Grand Master of the Order of the Holy Sepulcher, gave the keynote address. 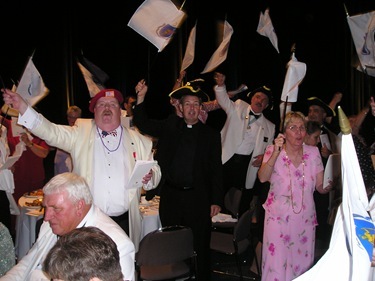 At the beginning of the banquet, they played the national anthems of Canada, the Philippines, Mexico, Poland, the Dominican Republic, Puerto Rico, Panama, the Bahamas, the Virgin Islands, Guatemala, Guam and Saipan. 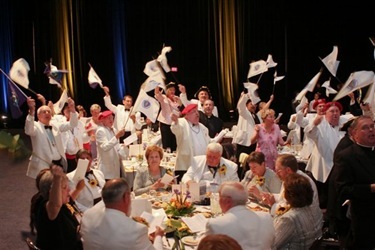 Then, during the course of dinner, we sang the theme song for each of the 50 states, Guam, Puerto Rico and all of the provinces of Canada. 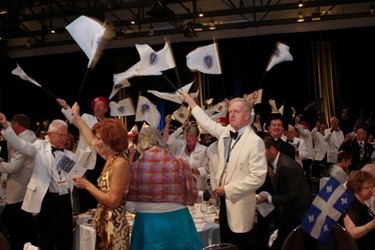 When it was time for their song, each delegation stood and waved flags. I can say the people there really enjoyed the evening. It was also great to have Jay Fadden from our Catholic TV there, interviewing people and reporting on what was going on. Jay also interviewed me and I want to share that interview with you. 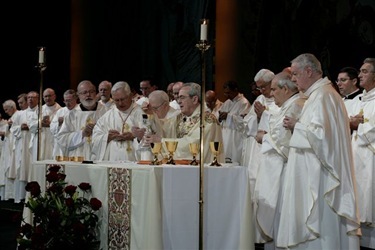 The next day, Wednesday, we celebrated Mass for the Feast of the Transfiguration, which was presided over by Cardinal Justin Regali, the archbishop of Philadelphia and celebrated by Cardinal Jean-Claude Turcotte, the archbishop of Montreal, who preached on the theme of the Transfiguration. After Mass, we made our way to the airport and flew to Montreal, where we expected to catch a 2:20 p.m. flight home to Boston that was cancelled. 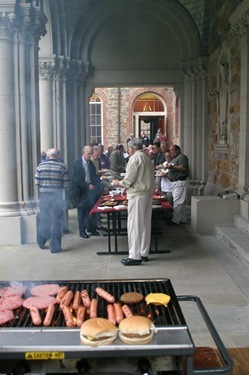 That flight would have gotten us back in time for the celebration with the priests at St. John’s Seminary for our annual holy hour and cookout for the priests at the seminary that we hold around August 4, the Feast Day of St. John Vianney, the Cure of Ars, who is the patron saint of parish priests. We ended up waiting until 7:30 in the evening before we were able to catch a plane back, and so we were not able to attend. 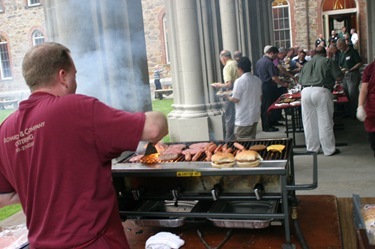 Everyone I talked to about it said it was a great success and that 120 priests came out in the rain to be a part of it. I also heard that Father Bill Schmidt gave a very insightful and entertaining lecture of the history of the priesthood in the archdiocese. 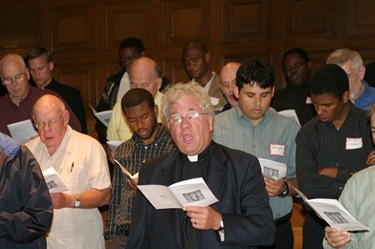 At the holy hour, Father Arthur Kennedy, the rector of the seminary gave a commentary on the life of the priest, who experiences both the suffering and the glory of the Lord and his people. I wish I had been there.